In the legal cannabusiness, no job possibility is off the table. As cannabis culture becomes further ingrained into pop culture, freelance marijuana jobs are cropping up along metropolitan areas throughout the U.S. Though some sales positions, such as budtending don’t really lend themselves to freelance, many creative, administrative and online jobs in the industry are perfectly suited for freelancers and independent contractors. Dreams really can come true! The experimentation period has passed and thankfully, marijuana critic jobs are here to stay. Cannabis critics are wise strain sages that help to give readers a well rounded review of the taste, effects and medical implications of a wide variety of cannabis products. Additionally, as cannabis critic jobs have become more pervasive, critics also review products and paraphernalia such as vaporizers and bongs. Working as a cannabis critic likely means you will be working as a compensated independent contractor. These freelance marijuana jobs allow for critics to make money, without actually being employed by the publications they write for. Jake Browne, who is often considered to be the “first” cannabis critic, has gone on to use his critical clout to not only review products, but contribute consistently to The Cannabist, which is the The Denver Post’s very own ancillary weed publication. When you think of freelance marijuana jobs, the image of a writer grinding away at their computer in the confines of a cafe may come to mind. Weed writers are increasingly in demand to cover the frequently developing cannabusiness. Recently, as more states pass recreational legalization measures, print and online newspapers and magazines are seeking informed writers who are proficient in conducting basic research and making astute observations about the direction the industry is going. Cannabis writers are needed to explore both the cultural elements of cannabis, such as arts and entertainment, as well as looking into cannabis as a medically powerful plant at the mercy of antiquated federal institutions. Often, freelance marijuana jobs are best suited to “mobile” careers, where daily tasks can be carried out online, thanks to a computer and internet access. This is why being a web developer is one of the best freelance marijuana jobs. Web developers are taking advantage of the breaking business by creating apps and websites to streamline and facilitate customer access to cannabusinesses and products. Developers are also working to help the businesses themselves, creating job boards and staffing services like Canna Recruiter, Ms. Mary Staffing and Weed Hire. Developers often have the ability to work as freelancers, completing work on a project to project basis. For those developers out there who are early and shrewd enough to secure a big piece of the cannabis pie, this sort of freelance work can be very lucrative thanks to the overall novelty of the industry. One of the necessary jobs of the cannabusiness that has been especially bolstered by rec legalization is cannabis consulting. Lawyers and experienced cannabis industry professionals are making bank, freelancing as consultants to help members of the industry open a business, train their staff and answer legal questions. Consultants can operate in a number of ways, including on a case by case basis. Freelance consultants can decide which clients to take on and the projects therein. Especially when it comes to answering questions about applying for business licenses and all the necessary compliance measures that come along with the process, lawyers are benefiting from the somewhat confusing legislation potential business owners have to navigate. In some cases, lawyers are choosing to focus their business specifically on the weed industry, creating a niche for themselves. As far as freelance marijuana jobs go, this skillset has one of the highest potential payouts, given the industry credibility and experience that comes along with cannabis lawyers. Like consultants, marketing firms and ad agencies are beginning to dial in their services to support the cannabusiness. Dispensaries, glass shops and any other pot-centric business can benefit from cannabis marketing and branding strategies. Freelance marketers can find the strong, unique traits of a business and use those qualities to (hopefully) increase a company’s profit. While basic social media and email marketing may be carried out by internal staff, businesses contract marketers when they want to make a bigger impact on the scene. The importance of marketing in the marijuana industry is not to be taken lightly. Marketing is essentially responsible for mainstreaming cannabis culture; in fact, it’s thanks to marijuana marketing that cities like Portland, OR and Denver, CO can embrace legalization as openly as they have. Information technology services are essential for cannabis dispensaries. Everything from point-of-sale systems and security measures require the assistance of an IT service member. Given that legal cannabis dispensaries are forced to operate almost exclusively with cash due to federal stalwart, security is especially important for protecting against internal and external theft. In addition to cash sales, dispensaries are also targeted based on the products they sell. Freelance marijuana jobs for information technicians establish relationships with individual businesses, building a significant network of clients. With all the legal pot shops soon to be opening up, thanks to recent legalization measures passing in California among other states, technicians will have plenty of work to keep their hands full. Artists and graphic designers who can find consistent work in the cannabis industry really benefit from the nature of freelance marijuana jobs. Artists can be commissioned to take on specific projects, and graphic designers are needed to create professional literature like business cards and pamphlets, as well as for websites and blogs. Graphic designers with experience can take on the right amount of projects to suit their schedule, without having to commit to long term work or business partnerships. Graphic design has also been the method through which a lot of cannabis facts and history is distributed. Several infographics that delineate the differences between marijuana strains, as well as between different compounds like THC and CBD have been responsible for expanding the reaches of cannabis influence. Most individuals who work as cannabis photographers do so on a freelance basis. Marijuana photography jobs can be both creatively satisfying and sustainable for those interested in the cannabusiness. Photographers help to establish the tone of cannabis culture, alongside marketers and designers. Their influence can be seen in the way they compose a shot, how it is edited and printed. 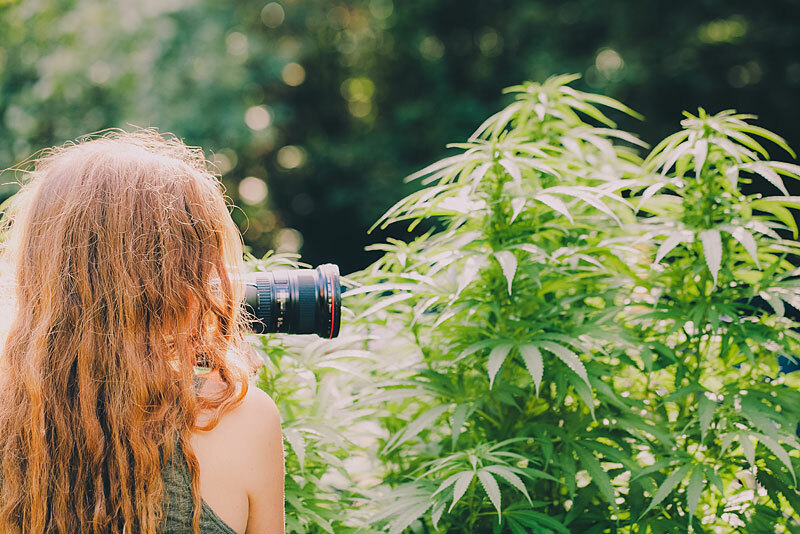 As more businesses seek out imagery for their business or would like to hire professionals to shoot their inventory, photographers will be in demand to meet the increasing exposure of cannabis. The beauty of cannabis photography is that photographers can take on a variety of projects and build a consistent client base without having to commit as an employee to one company. What is it makes freelance marijuana jobs so appealing? Freelance jobs offer contractors greater control over their schedule and work opportunities. Freelancers usually reject the conventions of the nine to five lifestyle and incorporate their skills into a business plan that allows for more creative control. Many jobs traditionally not found in a freelance setting are becoming increasingly available due to advances in technology and the ability to communicate with more intimacy than ever before. Developing a strong skillset, whatever it is, can help to establish your personal “brand,” which you can then use to your advantage in building a business. Marijuana dispensaries are a rare example of a major employer in the cannabusiness that doesn’t really work well with freelance. Being a dispensary budtender, receptionist or security guard almost always requires part or full time employment. Dispensary employment is organized around consistency. Consistency in products and environment, but also in staff. This is why dispensary hiring managers want to employ individuals who are planning to stay with them for the foreseeable future. Like any path in life, being a freelancer is not without its inconveniences. Some individuals report how the inconsistent nature of their income causes them high levels of stress. Additionally, it becomes the independent contractors responsibility to keep up with all of their tax forms and make sure they are paying quarterly, or however they are required for their position.